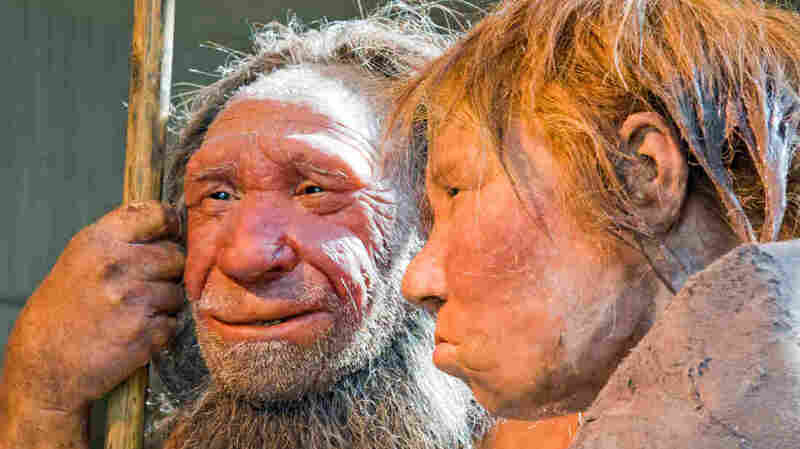 Neanderthal Genes Live On In Our Hair And Skin : Shots - Health News Scientists know that a small percentage of humans' genes came from Neanderthals. But they were surprised to find that one-fifth of Neanderthal genes are in modern humans living today. That includes genes associated with diseases including Type 2 diabetes, Crohn's disease and lupus. Neanderthals died out long ago, but their genes live on in us. Scientists studying human chromosomes say they've discovered a surprising amount of Neanderthal DNA in our genes. And these aren't just random fragments; they help shape what we look like today, including our hair and skin. A startling 20 percent of Neanderthal genes live on in us today, according to a report published Wednesday in Science magazine. Researchers found that out by combing through the genes of more than 600 living people. "We previously knew that about 1 to 3 percent of non-African genomes were inherited from Neanderthal ancestors, but the key point is that my 1 percent might be different from the 1 percent Neanderthal sequence that you carry," says Josh Akey, an associate professor of genome sciences at the University of Washington and a coauthor of the study. "We don't know exactly ... which trait they were influencing, but they likely have something to do with skin or hair biology," Akey says. Africans didn't pick up those traits, since Neanderthals originated in Europe. But this crossbreeding may affect how Europeans and Asians look today. Another research group, this one at Harvard, also has been combing through human genes looking for Neanderthal leftovers. That group's results were published Wednesday in the journal Nature and are remarkably similar to the Science study. "My guess is there must have been a small population of Neanderthals with which modern humans would have interbred," says Sriram Sankararaman, a postdoctoral researcher on the Harvard team. The Harvard team found some Neanderthal DNA in modern-day genes associated with diseases including Type 2 diabetes, lupus, biliary cirrhosis and Crohn's disease. But they don't know if those Neanderthal genes affect human health today. "So this suggests that the male hybrids might not have been fertile, whereas the females might have been fully fertile," says Svante Paabo, director of the department of genetics at the Max Planck Institute for Evolutionary Anthropology in Leipzig, who is a coauthor of the Nature study. "[Neanderthal genes] it might have been passed on particularly through females." "I think it's fascinating that the Neanderthals live on today, so to say, a little bit in us," Paabo says, "and not just in the form of anonymous DNA fragments that we pass on to the next generation, but also in the part of our genome that actually influences how we look, or how we behave or what diseases we have."